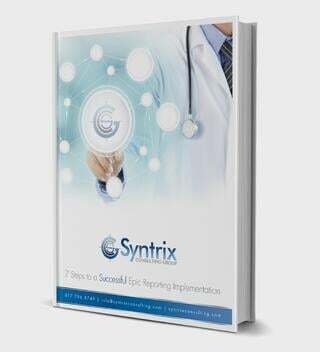 Syntrix specializes in data reporting and business analytics for healthcare organizations. While it is clear that healthcare stands to gain much from a more effective use of data analytics, the journey to achieve that value is still too long. We accelerate the move from data to results by applying our combined expertise in healthcare and business intelligence to show what really matters: We Make Healthcare Data Talk™. We know it takes more than technical skills to identify improvement opportunities in healthcare. Our solutions are driven by a keen understanding of healthcare industry issues and trends. We are former business intelligence practitioners at renowned healthcare organizations where we delivered reporting solutions and managed BI projects. Therefore, we are passionate about helping leaders with similar responsibilities be as successful as they can be. Their success is the ultimate measure of ours. Our comprehensive solutions include creating reports, dashboards, and data extracts that are used to improve patient care, financial decision support, quality reporting, regulatory compliance, and operations management. Contact us to see how we can make your data talk.